Good morning! I am SO glad the weekend is finally here! It’s been a wild week. This week we celebrated my youngest son’s 6th birthday! Woohoo! As I mentioned in my last post, he is a very picky eater. He doesn’t eat a wide variety of foods, the only plus being that he doesn’t eat hardly any sweets. He doesn’t like cookies, cakes, candy, or chocolate. Sometimes I wonder if the stork brought me the right baby, but then I remember he gets some of this rejection of sweets from his father. The only “treats” he likes are things like Teddy Grahams and the occasional Nilla Wafer. The one sweet my son does like is French toast. He even likes to dip his French toast in syrup (a BIG deal for this boy with sensory issues). As soon as we discovered his love of French toast, I set out to find an easy recipe and perfect my French-toast-making skills. One of the easiest recipes I found was Robert Irvine’s, available at Food Network. It is super yummy! And I’m proud to say I have perfected making it on our Cuisinart Griddler. 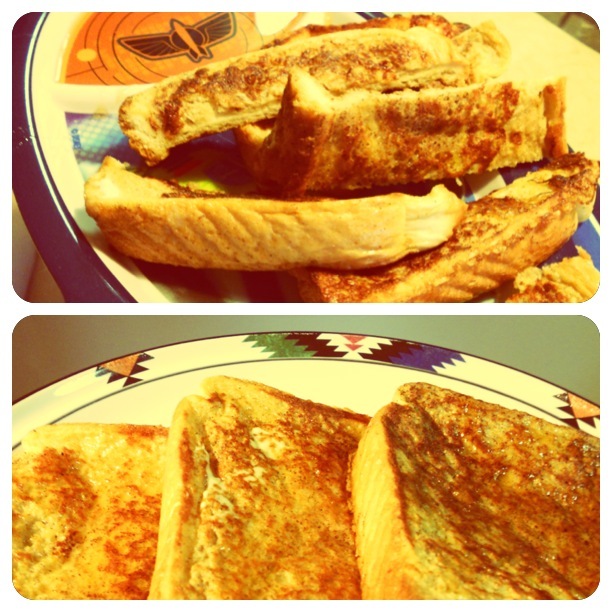 I’m a French-toast-making machine. Because my son’s birthday fell on weekday – when the odds of me making a large breakfast and still getting everyone out the door on time are not very good – I promised him that I would fix him a big French toast breakfast today, the day of his birthday party. Which I did. Here’s to a great weekend! Hope you have fun whatever your plans!